Allied Authors of Wisconsin member John D. Haefele’s first foray into book-length literary criticism has made quite an impact. 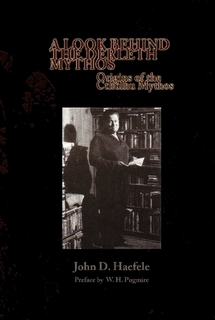 In the months following the release of A Look Behind the Derleth Mythos: Origins of the Cthulhu Mythos — Haefele’s study of August Derleth’s contributions to H.P. Lovecraft’s shared system of lore — the book has received a number of positive and balanced reviews, including some early praise from literary critic Don Herron. “Thankless” might be putting it mildly, in light of one scathing review written by leading Lovecraft scholar S.T. Joshi. “Lovecraft Literary Feud: S.T. Joshi Rebuts John D. Haefele,” an article by Peter Cannon in Publishers Weekly’s news blog, sums up Joshi’s reaction and links to his critique. After several invitations from Lovecraft scholars, Haefele presented his response to Joshi’s rebuttal on Herron’s website. A Look Behind the Derleth Mythos, published by H. Harksen Productions, can be purchased at Amazon.com, Barnes & Noble and Lulu.com. Haefele is currently working on his next book. This entry was posted on Tuesday, August 27th, 2013 at 7:12 pm	and posted in News. You can follow any responses to this entry through the RSS 2.0 feed. John D Haefele indicates that the feud goes on.